Thatcher's Funeral Is Set For April 17 : The Two-Way The former British prime minister will receive full military honors. Queen Elizabeth II is among those set to attend. Thatcher died Monday at the age of 87. 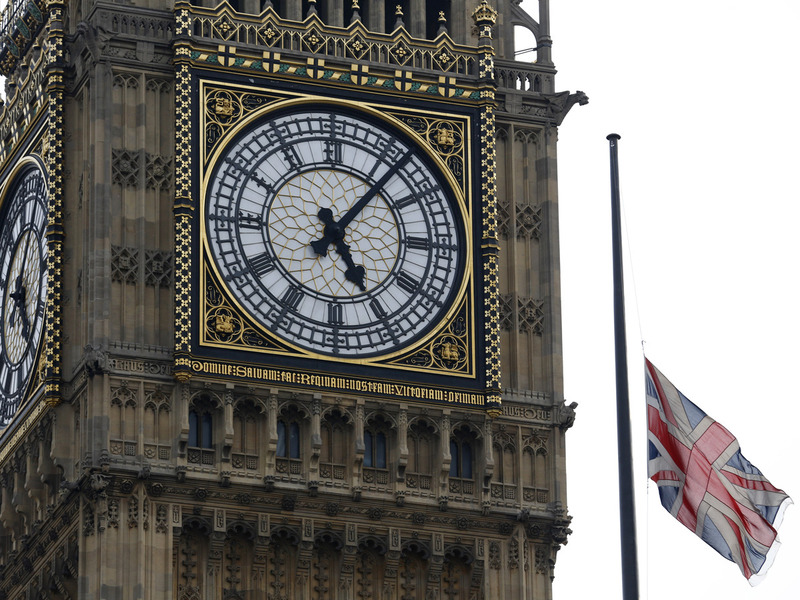 A Union flag flies at half staff over the Houses of Parliament, and next to the Big Ben clock tower, in honor of former Prime Minister Margaret Thatcher, who died Monday. British Prime Minister David Cameron's office announced Tuesday morning that "Lady Thatcher's funeral service will take place on Wednesday, 17 April 2013 at St Paul's Cathedral." The "Iron Lady" — former Prime Minister Margaret Thatcher — died Monday in London following a stroke. She was 87. According to the BBC, the funeral ceremony will include "full military honors." Both Queen Elizabeth II and her husband, the Duke of Edinburgh, plan to attend. It will be a "ceremonial" service like those held for Princess Diana and the Queen Mother in recent decades. That's "one rung down from a state funeral," the BBC adds. According to USA Today, state funerals are normally "reserved for members of the royal family ... [though] the last state funeral held in the United Kingdom was in 1965 following the death of Sir Winston Churchill." Thatcher was a controversial leader. During her 11 years as prime minister (1979-90) she teamed with President Reagan to stand up against communism. But she also broke Britain's trade union movement — angering many — and led her nation into a short war with Argentina over the Falklands. There were some arrests and injuries at "celebrations" of her death Monday night in Britain, the BBC says.